Light weight leather with the look I was going for!! Nice quality leather! 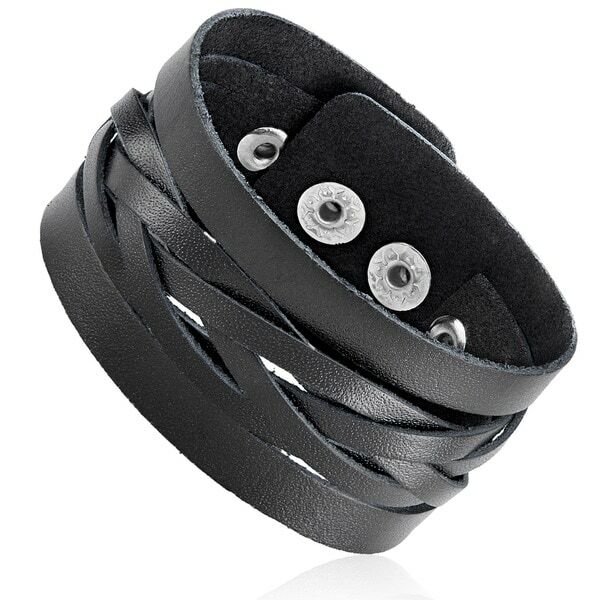 Keep yourself fashionable and in style with this handsome leather bracelet. This men's jewelry item features a rich black wide leather cuff with a cut out woven strand in the center of the bracelet. The cut out woven strand adds a distinguishable style which will sure get you noticed when your wear this bracelet. The leather bracelet is soft and flexible, and contours well onto the shape of your wrist for a comfortable wear. This bracelet is 26mm wide by 3mm thick, weighs 9.9 grams, and secures with a snap clasp. The snap clasp closure on this bracelet allows you to size the length at 7 or 7.5 inches. This is a great leather cuff bracelet. The smell of real leather and a perfect fit! Don't hesitate and buy this as it is quality and inexpensive. Got this for my son, it's a nice looking bracelet. He hasn't worn it so I plan to take it back and wear it myself. Tried it on as soon as I got it and fell in love with the way it's stylish and looks stunning on my wrist! Yeah they were on sale for *** but they're worth about *** each. What a jip!